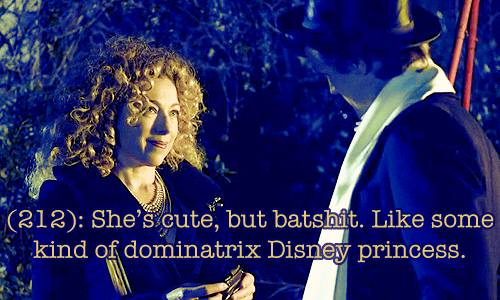 River Song to meet Fourth Doctor. I have been saying for years now that Moffat has been re-booting the show… Here is how he did it. So, I guess most people have lurkers. And sometimes they de-lurk, and it's great. However, I think my most recent de-lurked lurker is in a category entirely of their own: They wrote me an essay. ANYWAY - then they allowed me to post it here for all of you to see, so that's what I'm doing. Their name is BasiliskRules and can be found under that name on DeviantArt and FF.Net. Here, however, is their essay. Enjoy. And please leave feedback! Once more, I marvel at how complete a picture we have of River's life. We see her from cradle to death - and beyond. Of course there are untold stories we haven't seen, but still... We have a richness. Alex Kingston Wins Anglo Fan Favorites Title, Named Woman of 2013! River Song made her first appearance five years ago today, leading an expedition to The Library where she found the Vashta Nerada, Donna Noble… and the Doctor. Although he didn’t have a clue who this charismatic archaeologist was, she certainly knew him, recalling days he had yet to live with an affection that indicated they would become more than just traveling companions. Go here for more (their favourite quotes, a new gallery, a quiz etc. ): Happy Anniversary River Song! OH MY PONDS THERE WILL NEVER BE ANYONE LIKE YOU! Summary: There there, baby, it's just textbook stuff. River/Awesome, River/Doctor. Because I won't be talking much about Clara, and that review does a beautiful job of explaining a lot of the ways I see her. Show is killing me with Too Much Meta. Have about a million different thoughts. Amy: You can’t just drop me off at my house and say goodbye like we shared a cab. The Doctor: What’s the alternative? Me standing over your grave? More important than my rambling is this vid, however. I can't even BEGIN... Although it (just like #1Crush) pairs up the scenes in my icon. This show. This ship. The other thing was continuity - I knew the *story* continuity was fine, but that a lot of people have been very unhappy with the second half of S6, due to River’s characterisation, so I was curious how well that would hold up. As in, how well would calm, stoic, older Library!River fit with young, impulsive, dangerously determined younger River? And you know what? They fit perfectly. As a matter of fact I see so much of younger!River in older!River that it’s quite ridiculous. River is River is River, just like the Doctor is the Doctor is the Doctor... And older!River isn’t all that stoic. Oh no. Poem: The Song of Song.